The Hillary was on my “to do’ list as the photos of the trail and the map made it look a very appealing run. Showing 80kms of up’s and down’s on a trail hugging the coastline. A last minute realization a support crew would be very helpful. So a quick call to mum “how about a holiday in NZ?” – not much convincing needed! This was my first race for 2016, and I’ll let you in on a secret I was excited but also quite apprehensive. My Everest was to cross the finish line, as it had been a little while. There were about 70 runners milling around the start line, eagerly listening to Shaun’s last advice on his wee race. Early (pre 6 am), dark and already 18.C, no arm warmers needed! But I was armed with Beth Cardelli’s splits from last year as a goal, and to give my support crew checkpoint time estimates. Time to get the legs moving! A ‘quick’ 2km loop through the forest to spread us out, soon we all settled into a nice single file on the jaunt back up to the start area, and then we were onto the Hillary trail proper, with some fun single trail to which felt fast in the dark. Sunrise wasn’t far off, so it wasn’t too long before the torch went away, then a few more short sharp ups and downs, before the decent into Huia. This was only 14km into the run but a good chance to drop off torch and pick up fuel as the next time I’d see my support was at Piha at 45kms (although 2 great checkpoints along the way). 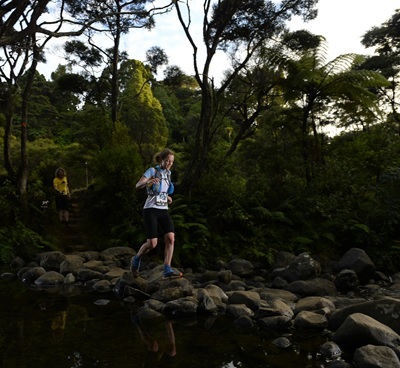 Crossing the creek to the checkpoint at Huia – nice stepping-stones to keep my feet dry. The first half of the day Corinne and I played tag. 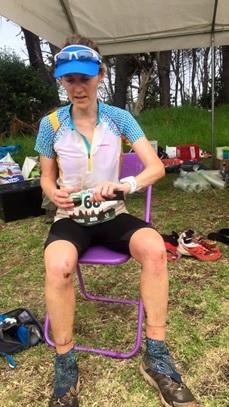 I followed her out of Huia, and we comfortably climbed the biggest hill of the day, the marshals on the trail kept giving me updates of our splits. This next leg form Huia to Whatipu, had the best views! With the green hills of Manukau Heads as I peered south across the water, and then the striking coastline to the north towards Karekare as the trail rounds the point before dropping into Whatipu was spectacular. What goes up, must go down! Unfortunately this went for me too. Splat #1 for the day was about a 1km out of Whatipu, and it was a pretty good one at that. Left foot nicked a tree root, a few stumbles into a tree stump, at a perfect height to whack my shin, then knee, causing complete loss of control and thus a tumble into the bushes off the side of the track. Eek! On my positive side I had two intact ankles, just some bumps and grazes, and a pretty sore knee. I got into Whatipu, filled up some water and was on my way. A nice firetrail to test how my knee was – all seemed great. Then splat #2. Time to yell at myself to lift my feet and run! This seemed to work. I was really enjoying the running and there were much more runnable sections than I anticipated. Don’t let me mislead you thought, there were still plenty of ups and downs they just never went on for too long. Plus there was also plenty of wider open trail. Next into Karakere or the “Death Cheetah’s” checkpoint at 36km for some water and coke. 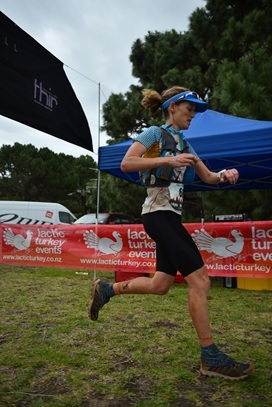 I continued to enjoy myself on the run towards Piha, and then one of the Marshall’s said Corinne was only 4 mins in front, well, I must have been daydreaming and slowed as the 1 to 2 mins time checks I’d been receiving had suddenly expanded. 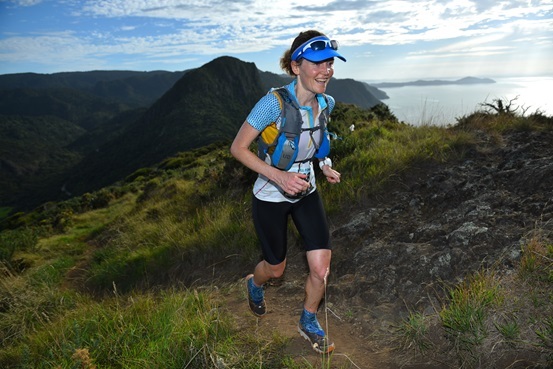 Next was through a section of single trail with lots of visitors to see the falls, then I popped out onto the road to run into Piha, and to my surprise Corinne was just ahead. Which meant we did run into the checkpoint together. But this last km into Piha was the first time we’d seen each other in a few hours. I was feeling really good here, even with the heat. We were both quickly through Piha and onto the black sand beach. As I got to the dunes I looked behind and Corinne had dropped back, so I decided to push up the hill. The 34km runners start at Piha. I’d anticipated they’d be on the beach ready to go, but I had their start time wrong, they were all on the trail ahead. I started catching them. This was a great motivator for me and helped me keep moving quickly up the hills towards Bethell’s Beach. I was staying at Bethell’s Beach, so I had jogged around the lake nearby the day before and seen the trail heading up, noting it looked like it would be a technical descent. But before I knew it I was this lake near Bethell’s, having easily dodged rocks and tree roots! I knew the km’s around the lake were a nice groomed section of trail and then a short stream run before the checkpoint. Easy, even if hot – and still on track to be sub 10 hours to the finish line. 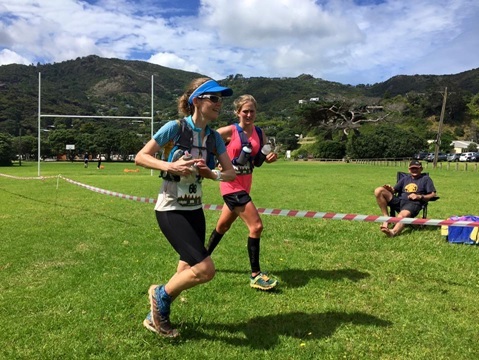 Bethell’s was alive with people, the 16km runners were yet to start, they had a bit of a loop before they would catch me on my trail, so I wanted to keep moving. A quick hello to mum for some more fuel (liquid fuel was a real winner in the hot weather). I hit the single track and bang – the heat – a black sand trail winding up to the headland. I told myself just keep moving only 16km to go…easy! The faster people in the 16km group didn’t take too long to catch me, and soon I had to let people past. Not such a good motivator. It started to spread out, and I settled back into the run with the 16km runners that were running at a similar speed., but we did play leap frog for a while, as I’d slow on the ups but then catch and ask to pass again on the flats and downs. I wasn’t in much of a talkative mood with the runners around me (sorry to those who tried to talk). 34km runners were fading as well, there were a few people on the side of the track grappling with the heat. For me, light-headedness had set in with the heat, and my legs were starting to cramp. Splat #3 – a cramp in my quad and my knee gave way, this time there were people to pick me up off the dirt (Thanks!). Shortly after I was super excited to see two girls on the track with a hose and water jug. I leap-frogged the water line to keep moving. Just ahead was another Marshall, a quick question, how long to the next water stop? “1km at the top of the hill” Ah yes, I was reminded I had stairs to climb. This was going to be hot, but at least a good excuse to walk. Top of the stairs – running – there’s water insight! Top of the stairs to more water and coke! Excellent! Then onto the road for a run into Murawai. Perfect timing the clouds had just come over and the few km’s I have to cover on the hot asphalt seemed more manageable. I checked my watch – this was the first point I allowed myself to think the CR was possible. 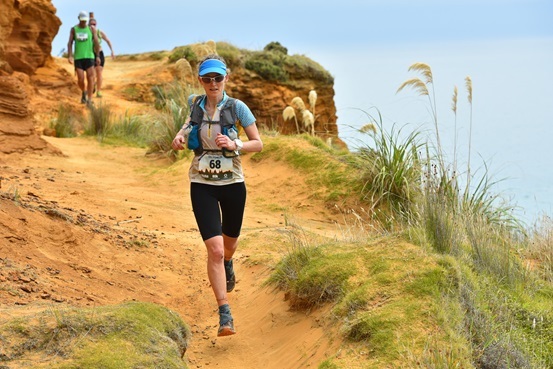 I was really happy to get off the asphalt and hit the final dirt trail, run past the Gannet colony and lookout and down to the beach, trying to spy how far along the beach I needed to run, before heading over the dunes and towards the finish line – Not too far! I crossed the dunes, happy to be off the sand, but still no sign of the finish line… a few more hundred metres to the cheer. I just slipped in with a new course record of 9:55:52, and just before the rain started to fall. A great day out! Next stop chair and more coke. Thanks to La Sportiva Australia for my shoes and ongoing support, to Tailwind for the liquid fuel. Plus of course a big THANKS to Shaun and all the volunteers for a great day! The markings and directions from marshals on the course were fantastic, my map and directions stayed hidden in my bag all day.